I took these photographs 13 years ago, on August 22, 1988, while on a dinner cruise around Manhattan. I used a Nikon F3HP and Kodak's then-new TMAX 3200. I regret that these are among the very few photographs I've made of the World Trade Center. 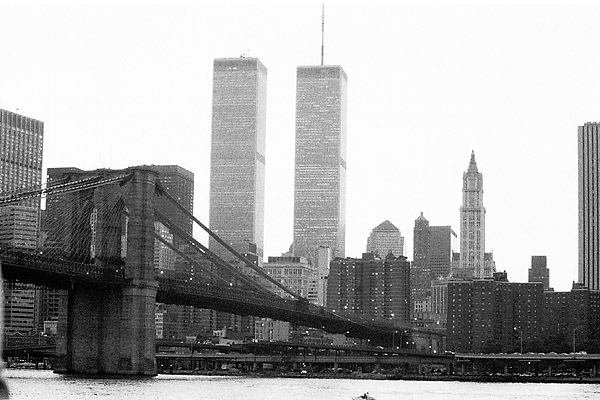 Like many New Yorkers born and educated, I had become pretty blase about the Twin Towers and skylines in general. So indifferent was I that I was probably stuffing my face as we swung around from the Hudson side, so I have no photos from that (better) perspective. So, sadly, these are the best I can do to pay tribute to those monuments. Even in the city of skyscrapers, for 28 years these magnificent structures dominated the skyline with their signature profiles. I add my prayers for those who have gone, for those who have been deprived of loved ones, and for those heroes who are working even now to find survivors and help the victims. May God bless them, and God bless America. 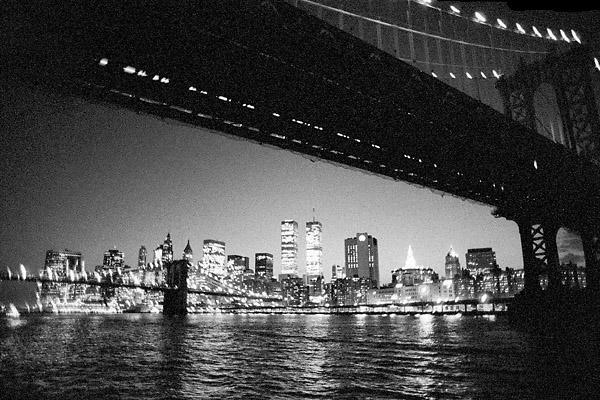 Twin Towers and the Manhattan and Brooklyn Bridges (August 1988) (Nikkor 24mm/f2).